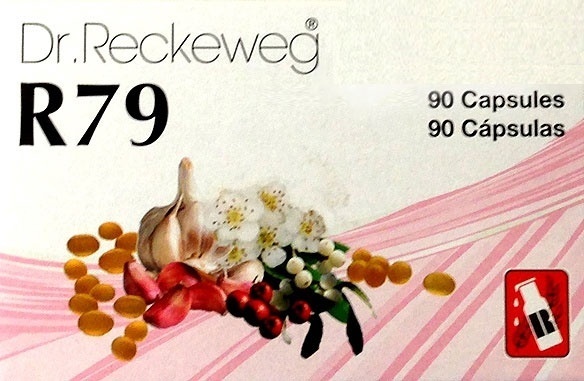 <b>NOTE:</b> NEW LARGE SIZE BOX - 90 CAPSULES<br> <br> <b>** TO VIEW THE MEANINGS AND USES OF THE DROPS, VISIT OUR BLOG - </b> <a href="https://drreckeweg.wordpress.com/2014/10/16/dr-reckeweg-homeopathic-drops-uses-and-benefits"><b>CLICK HERE.</b></a><br> <br> <b>Dr. Reckeweg</b> is a family-owned business whose origins can be traced back to the turn of the last century. Their drops are produced from raw materials of the highest quality and are strictly manufactured in accordance with the German Homeopathic Pharmacopoeia, the European Pharmacopoeia and comply with international production standards.<br> <br> <b>INGREDIENTS:</b><br> Allium sativa D1, Crataegus D1, Viscum alb D2. Allium sativa D1, Crataegus D1, Viscum alb D2.